Having suffered through several years of mediocre placekicking, the Packers used a second round draft pick to take the Polish-born Marcol. While he had been a NAIA All-American, there was some concern with his coming from a small-college program. Nevertheless, he became Green Bay’s first soccer-style placekicker. Packers went 10-4 to finish first in the NFC Central while leading the league in field goals (33). Lost NFC Divisional playoff to Washington Redskins (16-3). Marcol booted 21 field goals in 1973 and was again a consensus All-NFL and Pro Bowl selection in ’74 as he led the league in field goals (25), field goal attempts (39), and scoring (94 points). However, an injury in the opening game of the 1975 season cost him the rest of the year. 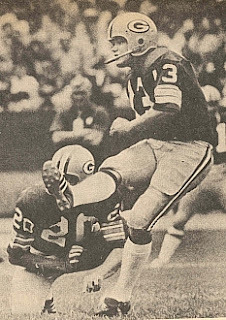 He came back and lasted another four full seasons for the Packers, although with lesser numbers, until he was let go during the 1980 season. Marcol had a brief stint with the Oilers in what was his final year. Overall, he kicked 121 field goals in 196 attempts (61.7 %) as well as 156 extra points. Combined with a touchdown scored in 1980 when he recovered a blocked field goal attempt, Marcol scored a total of 525 points.